30,000 CFM GreenHeck VAUB-36F17-I-A15 20hp 3' diameter tube-axial ventilation fan variable pitch blades (static adjust). 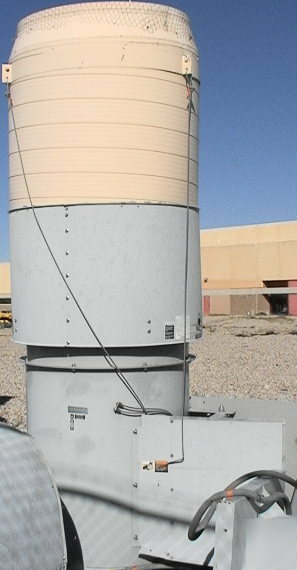 This exhaust fan (with this 20hp motor) can move as much as 31,500 cubic feet per minute of air or provide static pressure as high as 4" (at 18,000 cfm). Factory specs can be found at the following link. This unit includes exhaust stack nozzle and closeable damper. THIS LISTING IS FOR JUST ONE FAN. The motor mounts to the side and belts drive the blades through the tube shown in the image below. Blades factory set at 19 degrees. Oveall dimension including the base are about 5 feet by 124 inches tall. Might be just what you need for your serious exhaust fan application. Condition looks good functional used weathered exterior as shown above.